Weekly Update 2018-11: In honour of International Women's Day this past week, let's celebrate some amazing women across creative ventures. Jay Som brings us lush, melodic bedroom pop to float along as we explore DevTO's IWD event, inspirational illustrations by Ruby Taylor and a new $10 bill featuring Viola Desmond. I just couldn't contain myself until the inspiration section so check out this lovely illustration that celebrates women by Ruby Taylor. A native of California (which might explain the airy feel of her music), Melina Duterte's sound and lyrics feel really genuine and connectable to my life. I especially love how she can make humdrum subject matter seem beautiful and wondrous through her musical expression. I don't know if I'm even doing her justice with my words, so just listen below. Favourite tracks include The Bus Song (yes, I also like the bus), Rush, Lipstick Stains and O.K., Meet Me Underwater (which sounds a lot like a sadder El Ten Eleven if you're into them). As an aside, Duterte picked her musical pseudonym Jay Som from the Wu-Tang Name Generator, the same place where Donald Glover found his pseudonym Childish Gambino. If you're interested to know, I entered Chloe and got Quiet Artist. Doesn't really match 100%, but I can work with that. This past Monday marked a really inspiring event I attended with some female coworkers for International Women's Day. The event is held every year by DevTO at the legendary Masonic Temple (which is a sight in itself), and featured four female speakers outlining their journeys and learning as women in the tech industry. Since I really find these events a little tiresome and that they take more than they give to the attendee, I was surprised and happy that it didn't feel as much like a waste of time and more about women and allies all coming together to support each other. 247 songs at the time of publishing - not bad. I think I'm about 70% done. Making the move from SoundCloud to Spotify is a true learning opportunity for me, since some of the songs I am searching for are listed as “greyed out” on Spotify. I have the option of uploading my own track to fill the gap - which I will do - but then what happens exactly? Do I get the ability to play that song from any device where my account is logged in? In other words, does that track now always exist inside Spotify for my account? I certainly hope so. While I am streamlining my music listening game, at the same time I have been biking a lot more and would like to take another stab at listening to podcasts again during my biking time. I have a lot of The Moth episodes to catch up on, so I might try to listen to a few this week to get back into the flow. On top of that, I'll be picking up my Jewish journey again. I am experiencing a realism that I lost the reasoning to include it in my life in the last little while. It didn't bother me because I had a lot of change happening and do feel like it's an obligation moreso than a tool to combat and understand my life. Which is to say that I want to do it, but it feels like something of a chore at this point. So, now that things feel a little steadier, I have time and motivation to pick it back up. I already made an appointment - which means I need to have something ready to discuss. I'll have some good reflection time this weekend as I man the basement of a house wherein my father is running an estate sale. I want to use it to write a blog post that's not a weekly update, and learn a bit more about dungeons and dragons in advance of the campaign my coworker is running for us next Tuesday. There was a great turnout of women at the International Women's Day event on Monday, especially for it being such a cold and blustery evening. I was mistakenly surprised for a moment to see that there were men also in attendance; in fact the emcees personally congratulated the first ticket purchaser (a woman in the third row) and the first male ticket purchaser (toward the back of the audience). It was at this moment that I realized I had been slightly wronged yet again by the gender roles at my workplace. One of the reasons I joined the company was for the strong women in leadership roles, and large amount of female developers. It's just unfortunately not a common occurrence in the tech-focused offices I've worked/interned in, so it was a big selling point. While I am continually in awe of my fellow female coworkers and all they achieve, I think there are certain things that still have room to improve. For example, we have a females-only slack channel inside which we discuss topics of women in tech and the like, so why not include everyone in such a discussion? I was surprised and then slightly disappointed that we hadn't extended the invitation to our male coworkers to attend this event with us. To make a lasting impact on gender equality, it takes everyone. This is a really random thought because I can't seem to really put it clearly with my coworkers - who say they need a forum to complain about the state of the women's washroom. But it reminds me of Facebook, where everyone's opinions are sucked into an algorithmic echo chamber to reside beside others who think and feel the same way. Why not try to open it up to dissenters to gain a broader understanding? I've got two female forms of inspiration this week. The first is the wonderful, whimsical and socially responsible illustrative efforts of Ruby Taylor. Based in the United Kingdom, Taylor has developed a strong style with bold colours and even bolder statements. I love how her work reminds me of cut paper and collage, mixing different patterns together to create something really eye catching. Check out Taylor's Instagram or website. 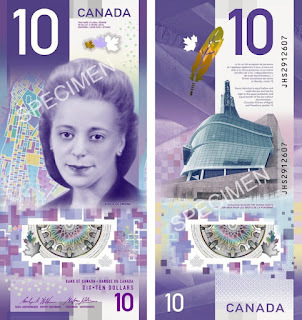 I was very impressed with the Canadian Mint with their new design for the ten dollar bill. It's got a lot going for it: it's beautiful, it's a new orientation (vertical instead of horizontal design) and it features a previously overlooked woman who is part of our country's history. Interact with the bill on the website. Viola Desmond remains an icon of the human rights and freedoms movement in Canada. A successful Nova Scotia businesswoman, she defiantly refused to leave a whites-only area of a movie theatre in 1946 and was subsequently jailed, convicted and fined. Her court case was one of the first known legal challenges against racial segregation brought forth by a Black woman in Canada.